The third Republican presidential debate is coming up, with this next installment of the GOP debates to be hosted by CNBC, and aired at 8 p.m. ET on October 28. The debate will be moderated by Carl Quintanilla, Becky Quick and John Harwood all of CNBC, who will be joined by a CNBC panel of political experts: Jim Cramer, Sharon Epperson, and Rick Santelli. If this last name sticks out in your mind, it could be because you remember when Rick Santelli had an epic on-air rant about the Federal Reserve in 2014. To call this episode a meltdown would be a severe understatement. At the time of this glorious explosion, Santelli was reporting for CNBC from the floor of the Chicago Mercantile Exchange. One of his primary topics of interest, as would become exceedingly clear during his epic rant, was the Federal Reserve. The 2014 Fed meltdown was certainly not the only time Santelli completely lost his cool while he was live on the air, but it was probably one of the most spectacular journalist breakdowns in the history of modern television. Santelli is now usually behind the camera and operates as an on-air editor for CNBC. The rant heard 'round the world went down during a "discussion" on CNBC's Fast Money Halftime Report around the question: "Is the Fed behind the curve?" Santelli, who was commenting from Chicago, started off sounding merely adamant, then his demeanor quickly escalated to extreme agitation before he ultimately went stomping off camera yelling "Hasta la vista!" Santelli became incensed when the segment's other participants would not agree with him that higher interest rates would lead to an improved economy (among many other Fed-related topics that were, frankly, a little hard to follow with all the interrupting going on). No matter how worked up Santelli became and no matter how much he yelled or interrupted, somehow the other commentators remained relatively calm and even-tempered, and tolerated Santelli's tantrum much better than I ever could. Among the phrases Santelli screamed (and I mean really hollered) into the camera were, "I have history on my side," "[The Fed] was never created to be a feel good institution," and "We're America, we don't believe in consensus!" Finally growing tired of Santelli's histrionics, CNBC senior Steve Liesman told Santelli that "There is no piece advice that you've given that's worked Rick." This of course sent Santelli so far past the ledge that his rant became completely inscrutable as he attempted to scream over Liesman. The whole ordeal bordered on surreal. Which is perhaps why he is maybe the best commentator for this next Republican presidential debate. It's only fitting that a debate featuring two CEOs and a retired surgeon (who are dominating political headlines and the polls) should have the screaming surrealist Santelli himself comment on their antics. Further, Santelli is literally the only person I can think of who could cause more of a scene than Donald Trump, whose brash finger pointing seems like kid stuff compared to what Santelli is capable of. 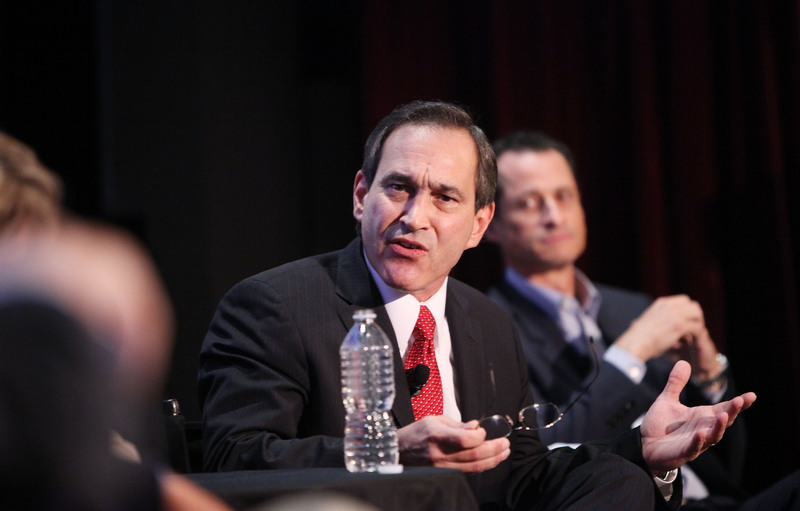 Will Santelli blow his lid yet again on Monday? Personally, I hope not, because reliving this epic rant has given me a migraine.